If youre looking to add interactive content to a tablet or iPad type of device, this Quizmaker template is a great place to start. The outside frame is shaped like a tablet and weve included a hand images that can simulate the use of the tablet. In the structure weve provided, a scenario is given and the learner has four options to choose from. 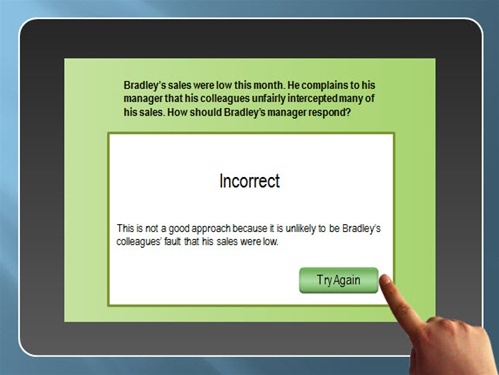 When the learner clicks one of the options, she gets custom feedback based on her choice. Its easy to keep the same structure and just modify the text on the screen, but this Articulate Quizmaker template is also flexible enough to allow you to completely change the look and feel of the content on the screen.